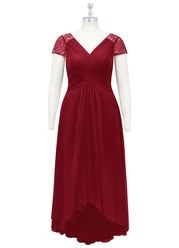 Lucille MBD is a floor-length dress in a beautiful column cut. 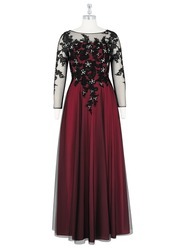 This dress is made of chiffon and has a white hand sewn jewels at the neck. Available in full size range (A0-A30) and custom sizing. Are the sleeves lined or are they the see-through fabric? 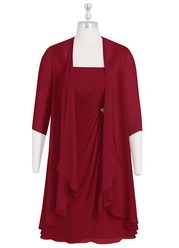 The Lucille MBD has chiffon illusion sleeves, they are not lined but they are not entirely sheer. Can you advise the length of the sleeves please? While I do not have the exact sleeve length, the dress is cut right at the elbows, based on the other measurements of the dress. It should not cover your elbows! Do they come wrinkled when sent in the mail? If so can a cleaner steam them? Because the dresses are mailed in a box, they can become wrinkled. If you have wrinkles- please do not use an iron! The best cure for any wrinkles is steaming them away. If you have a steamer at home you can do it yourself, or you can take it to a local tailor or dry cleaning and alterations shop who can do it for you as well. Does the sleeve seam extend all the way around, or is the fabric only connected at the top of the sleeve? The Lucille dress does have sleeves that are quite drapey, with a very loosely-constructed sleeve, so I'm pretty sure they would reveal the arm if you were to raise your hands above your head. Please describe the embellishments on the dress, are they pearl like? The Lucille is a lovely dress and the jewels certainly add a bit of sparkle, but I would not call them pearl-like. They more closely resemble diamonds/diamond beads with a silver backing. Yes, the dress is lined with a double layer of lining fabric throughout the bodice and the skirt, with a top layer of chiffon. 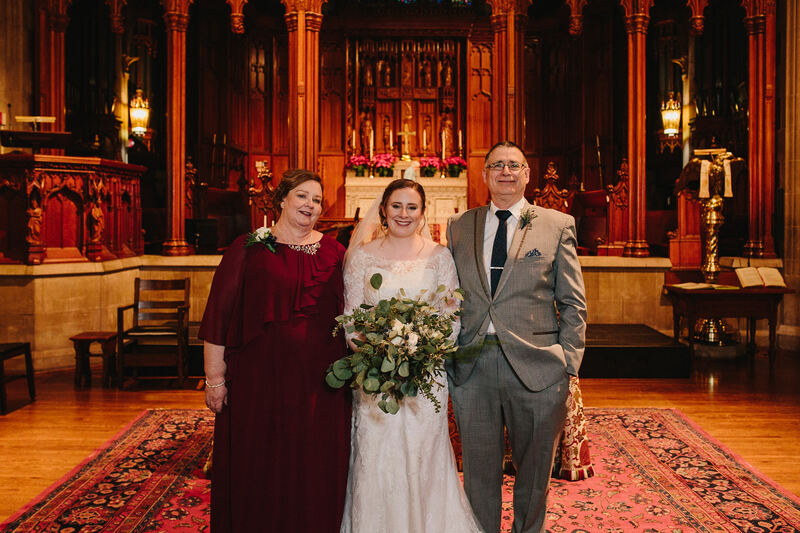 I wanted my Mom to look/feel beautiful at my wedding, but we didn't have much luck with formal wear options that could fit her shape. She became so disheartened after visits to department stores... 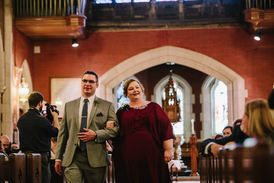 Unless she went with a sleeveless dress, which was not a good option for a Chicago wedding in January, it seemed there were no dresses with sleeves that could accommodate her larger arms. 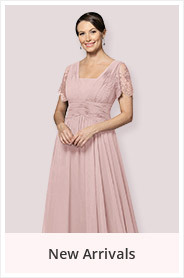 And apparently all Mother-of-the-Bride dresses only come in like 5 boring colors?! A specialty shop offered to custom make a fitted sleeve dress for her, but she was nervous about spending so much money on a dress that might not be comfortable. Enter Azazie! I was already using them for my bridesmaids dresses and had gotten great feedback from my girls on the fit/quality of the dresses. 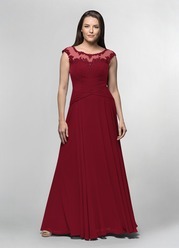 I saw that they offered Mother-of-the-Bride dresses and looked through them with my Mom. 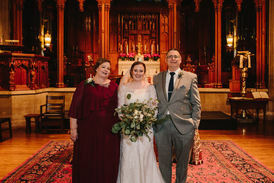 We immediately were drawn to the Lucille dress with it's billowy, flattering sleeves that would be perfect for her, and Mom loved that she could pick from such vibrant colors. She couldn't believe the price either, and for a custom sized dress, too! I took her measurements, adding an extra inch to the waist and bust for movement. She was so nervous waiting for the dress to arrive, worried it wouldn't come on time or that it wouldn't fit right, but I still remember her happy call to tell me how well it fit. 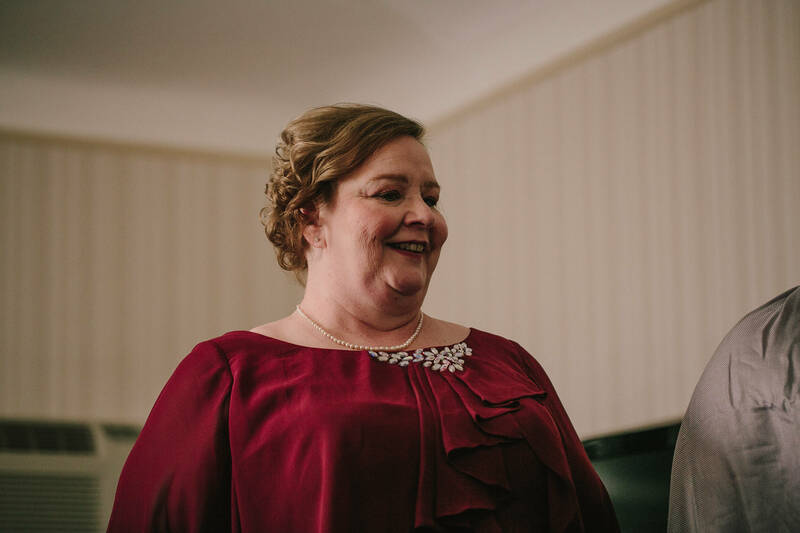 This dress was gorgeous and made my Mom feel like a million bucks, which rarely happens for her with clothes. The Lucille has a nice, draped looked, which is great for camouflaging the midsection, and the open, flared sleeves are terrific for bigger arms. We chose custom sizing and didn't need to make ANY alterations. The color (cabernet) was beautiful and the fabric quality was superb. It arrived in 3.5 weeks. I'd highly recommend this dress and Azazie! I am a big lady, so I worried, but the dress came in, and was exactly the measurements it said it would be. Fit beautifully! Loved this dress; the style; the way it was made; the quality of the fabric; all of it! And what a great thing to be able to try on a dress and SEE how it will work before the event! Was so thankful for the $10 "try on" option. Super! Thank you, Azazie! You have a new customer! 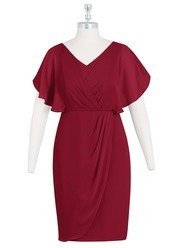 I've ordered the dress I want for my event now, and am looking forward to receiving it. This dress is very heavy and does not look as pretty as in the picture. I ordered the Sage and it is very large and very wrinkled. Make sure your size is correct in ordering. This dress is very pretty. I did not buy a custom sized dress. I have 7 months before the wedding, so I will have it altered. It is a good quality dress. Love the chiffon. It has 2 layers under the chiffon, makes it too heavy and hot, so I will remove one of them. Dress was shipped in a timely matter. 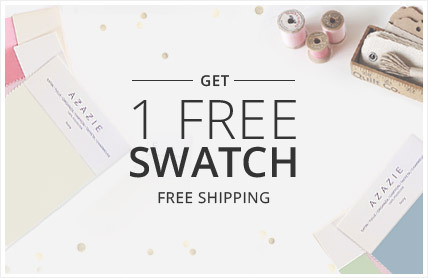 I would recommend buying from Azazie! 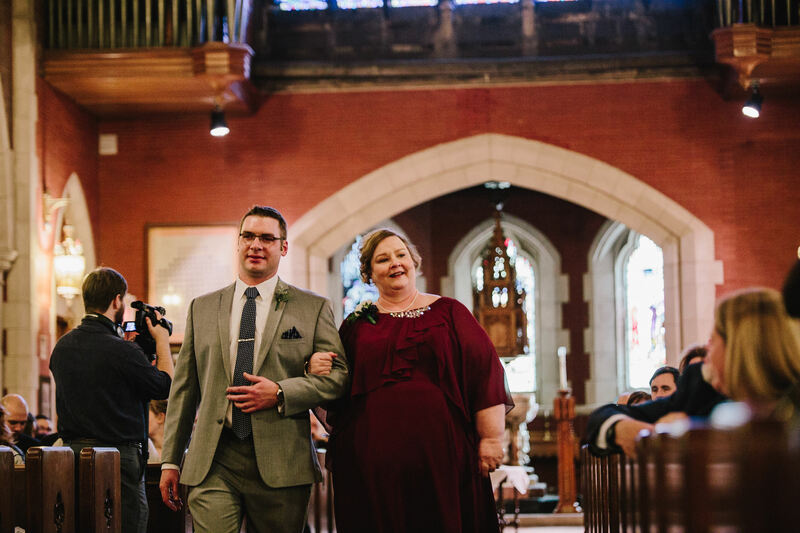 We ordered a custom dress for mom, and loved the results. The dress arrived in a garment bag and the fit was perfect. 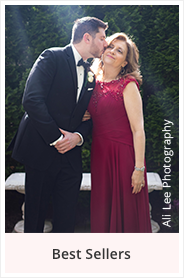 Mom felt like a queen! I would suggest this site to others as the price equaled the quality hands down. The dress is lovely. Unfortunately, I used the measurement guideline photo for the hip measurement, and it was too tight around my midriff (belly). And, my measurements were taken by a professional seamstress/alterations friend of mine. She is now in the process of altering the dress. I would recommend the dress, but advise to be wary and make sure the measurements are taken at the widest part of the midriff.